Kedaresvara Temple of Belligavi is a beautiful, well preserved except for some acts of vandalism and currently well maintained temple of Shimoga district. 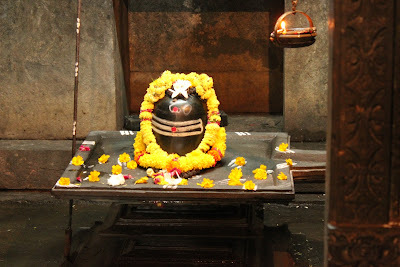 The temple is located on the outskirts of Belligavi village close to Padmasarovara Tavarekere lake. Balligave, also known as Belagami, Balligame, Balligrama and Balipura. Belligavi was an important centre of learning and contained five religious centers besides seven Bramhapuris connected with temples. It is also known as Dakshina Kedra due to its religious and cultural importance. It was a prosperous center during the period of Chalukyas of Kalyan (11-12th century). Built in twelfth century, the temple of Kedaresvara, in east-west orientation is a Trikutachala or triple-celled temple of the Hoysala style. The western cell has vestibule or Sukasani and the northern and southern cells have an Ardhamandapa, all opening into a six-pillared Mahamandapa which at east opens into a spacious pillared Sabhamandapa with entrances on north, south and east. 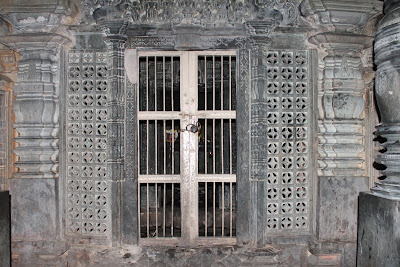 Interiorly the Mahamandapa walls are pierced with Devakoshtas while the western and southern cells have Siva-lingas, the northern cell enshrines an image of Vishnu. The exterior is austere save the indented features of Panchatantra design. The three towers of Tritala vesara class are treated with the wall details repeated at each tala and are similar in form to each other. 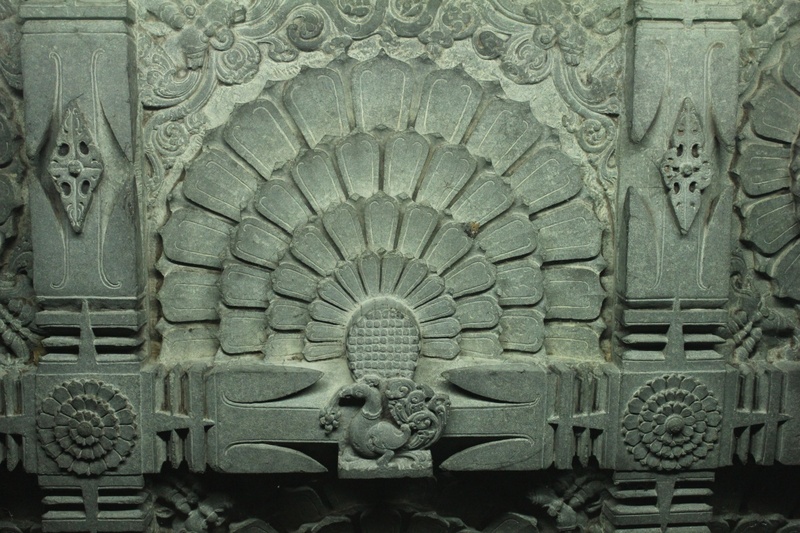 The ornate Sabhamandapa is the key feature of this temple, which has 16-sided fluted polished pillars some of which are treated with leaf decoration. The temple in its heyday attracted a fair number of the Kalamukha sect followers. In the same complex is a replica of the Kedaresvara Temple to its north-western side, which is also a Trikita (three-celled) structure. 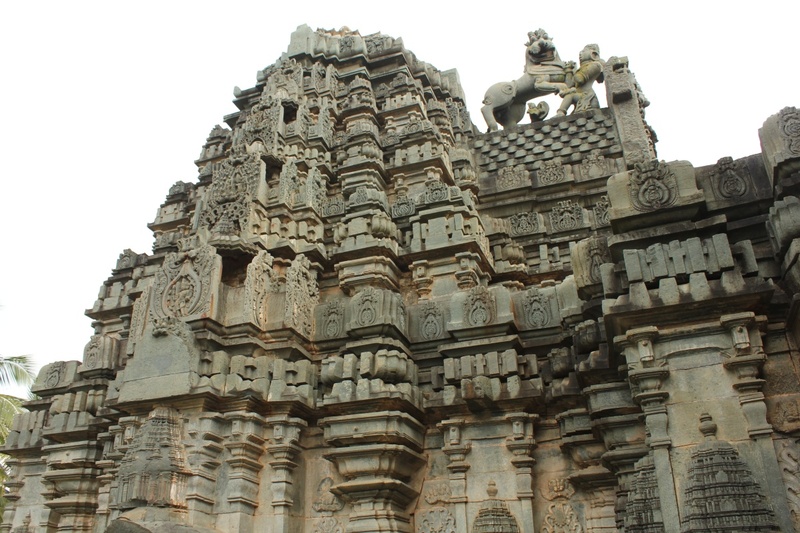 The temple care-taker told that Kedaresvara Temple was built by five sculptors- Namoja, Bamoja, Siddoja, Mallikamba and Malloja. In this picture western and southern Shikharas are visible clearly while the northern Shikhara is partly visible. This is the western shikhara. The lion at the top is prominent. The geometric design on the platform below the lion is unique. 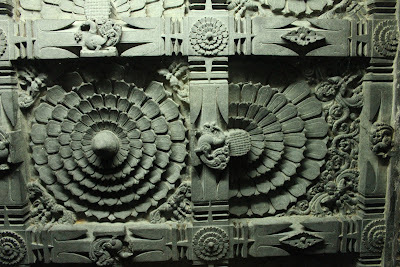 Interesting floral designs with idols of Gods and women in Bharatanatya positions. Elephants in various positions at regular intervals occupy the highest level of the lower half of the temple. 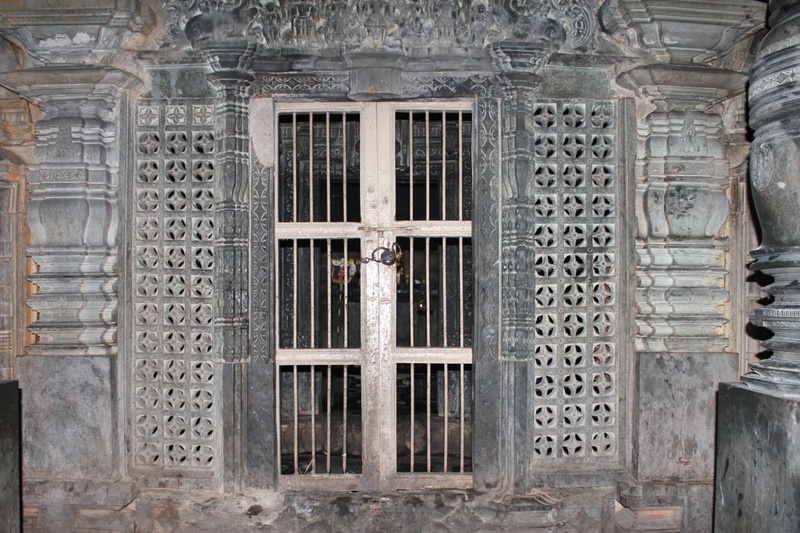 Jaalandra (artistic mesh wall) and stepped door frame decorate the western Garbhagudi wall. Couple of Nagadevatas with Halegannada inscription. 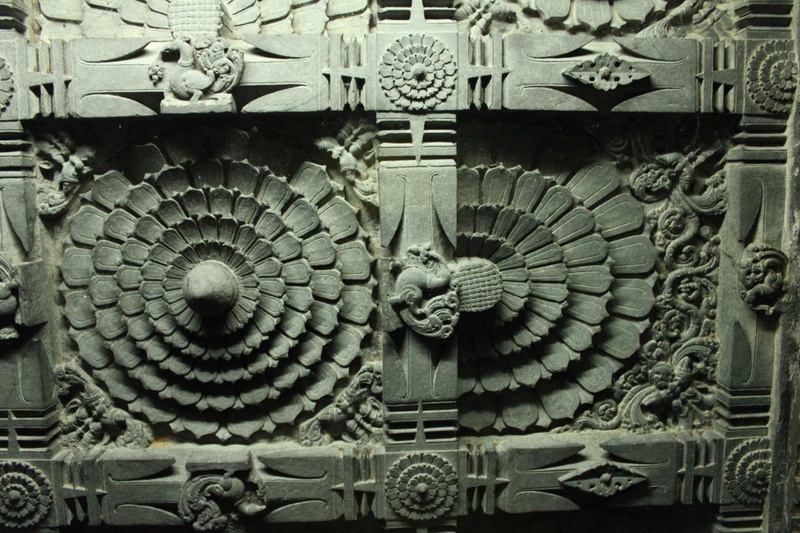 The ceiling features a matrix of lotuses in various stages; bud, flower and seed. The temple care-taker mentioned a term for this matrix, I missed noting it. Belligavi Basavanna is one of the large Basavannas (Nandi) of Karnataka. With hardly any place around Basavanna, its difficult to take pictures. 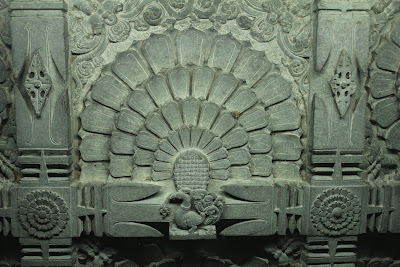 Same with two other indoor Basavannas- Madhukesvara temple in Banavasi and Bull Temple in Bengaluru. Ornamental sculpturing on Basavanna's back. Bells and trinkets adorn the jewelry. The details are amazing. 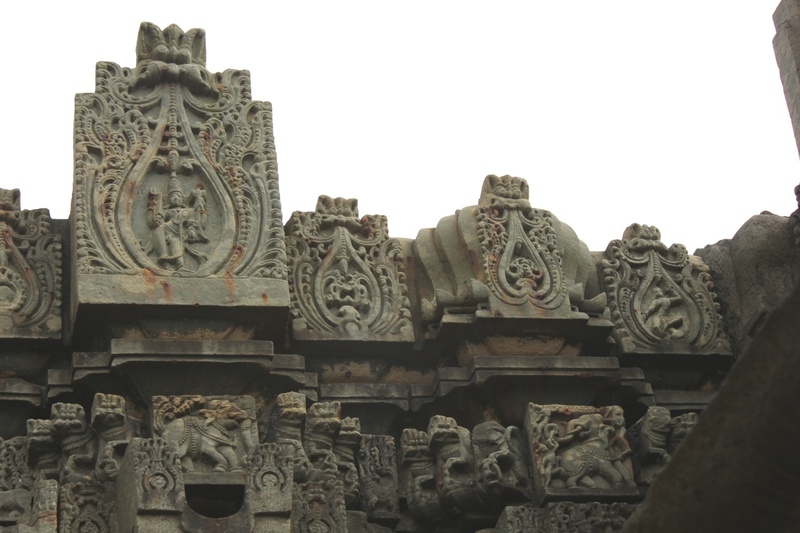 The exterior walls of Kedaresvara temple, actually the back-side of the Sukhanasi features 196 Bharatanatya Bhangis depicting various positions. 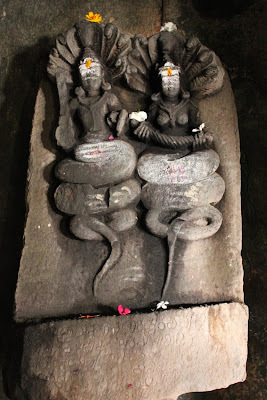 Talking about Indian classical dnace, Belligavi is birth place of a Hoysala Queen- Natyarani Shantala. Shantala ends her life by jumping off a sheer cliff at Shivagange. Allamaprabhu the mystic-saint & Vachana poet of 12th century was also born in Balligavi. 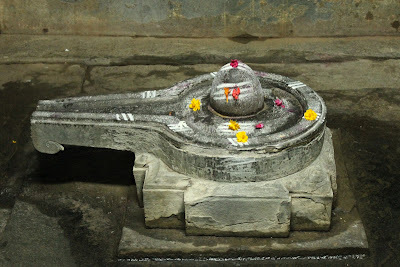 Right next to Kedaresvaragudi is it's replica but without Shikharas. This temple is known as Nagaresvaragudi. 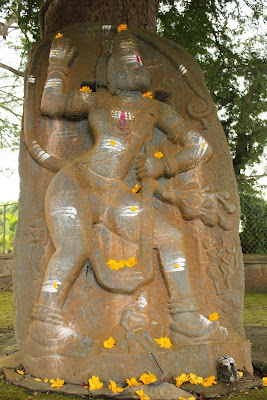 One of the three deities. This smaller, open-top structure (on the left) was supposed to have been used as a kitchen for preparing food for temple's devotees. The elevated platform on the right was used as a stage for dancing. Part of the kitchen. The hall surrounding this Garbhagudi like structure is spacious enough to seat 30 to 40 people. The temple has a museum, artifacts from Balligavi and other surrounding places are stored here. However the indoor museum is not yet open to public. The outdoor collection is interesting and has few unique images on hero-stones. Thank you for sharing your photos! I like taking pictures and that is what my blog is about. Your photos makes me wish that I can travel somewhere as well and take a pictures there.